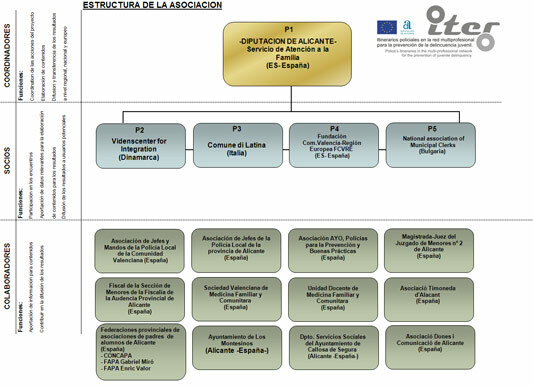 Is a public self-governing organization of Alicante County Council; it works in the search and treatment of the family problems. The organization is expert in solving interpersonal conflicts in the family, companies and professional groups and put into practice systemic methodology (holistic and relational). The work areas are family therapy and specific program design. The Institute Dr. Pedro Herrero has led 5 European projects (4 about the prevention of juvenile violence and 1 about the solving of interpersonal conflicts in companies). It works with a multi-professional network made up of health, education, and social service professionals (police, teachers, courts, public prosecutors, social services, family doctors, parent-teacher association), small and medium-sized enterprises. Is a professional non-profit association, established in July 2005 in Sofia. The idea of its establishment and its objects have been borrowed from the International Institute of the Municipal Clerks (IIMC), founded in the USA in 1947. The experience of this international organization, which has over 10 400 members from the USA, Canada, Holland, England, Portugal, Belgium, Australia as well as countries from South America and Africa, has been transmitted to us with the help of The Certification Institute of The Municipal Clerks for Central and East Europe (CIMCCEE), which was registered in our country in 2004 and is the first of its type out of the North America. The aim of NAMCB is to help the training and qualification of municipal clerks in Bulgaria by organizing seminars, conferences, experience exchange, by information and reference activity, as it takes part in national and international programmes and projects. The NAMBCB works very closely with the Municipalities and the multi-professional services whish are included on it. Is a public institution whose mission is to help facilitate the integration of migrants into the Danish society. Its purpose is to collect, adapt, develop and disseminate best practices on migrant integration. It conducts researches and surveys on language learning, employment and cultural integration of migrants, as well as workshops and courses on adult education and integration. Among its current programs are: a web-based, distance learning of Danish as a second language (www.dansk.nu), diversity management, micro-enterprise development for migrants, migrant and integration-related surveys, and experience sharing among, and development of integration methodologies in partnership with institutions involved in migrant integration in Europe. VIFIN has 15 fulltime staff, and a reach of over 5000 migrant students, accessed through its currrent projects and throught its network of local and national public and private organisations, learning institutions, NGOs, and other organisations involved in migrant integration. Was founded on 1932, with the name of Littoria. In 1934 it became a province capital and, after World War II, renamed Latina in 1946. Latina City Council is an Autonomous Entity based on constitutional principles, as well as on the law July 8th 1990, n. 142 with related modifications and integrations and on a present Statute. The actually City problems are: requalification of the urban weave, valuation of the historical and environmental patrimony, services and infrastructures of a superior level, social integration, activities and work for younger people. The City Council is entitled, within its duties, of managing the public service sector which are to produce goods and activities directed to satisfy social purposes and to promote the development of the local socio-economic and cultural environment and maintain territorial relations with all the social and economical organizations of the Latina’s territory in the framework of local, regional, national and international relations. The Municipal Police of Latina City Council has a very important role in the city. The main structure is divided about 3 departments: 1) Territory control 2) General affairs and contentious, 3) Environment, Commerce and others. To achieve the objectives of it works (prevention and repression of the delinquency at the urban ambit, road safety and viability, citizens information and contribute to nearing trough citizens and municipality institutions, and improve the quality of life of the citizens), the Municipal Police of Latina City Council make civics courses, road education and prevention of the young people criminality at the primary and medium schools. Is a non-profit organisation with a broad experience in the international dissemination of EU-funded projects. It has participated in more than 38 European projects of different fields as a dissemination partner. The FCVRE offers the experience of its highly specialised staff both in Brussels and in Valencia, including journalists with background in communications, design, web management and press relations. The FCVRE has with its ideal location at the heart of the European neighbourhood in Brussels, the Foundation can provide conference rooms with modern multimedia facilities and is the ideal premise to organise presentations for EU officers, relevant stakeholders and the media. The FCVRE’s role also includes promoting a better knowledge of European actions and projects among the Valencian Region.